Destiny Coach, Kathryn Joy Foster unveils her revolutionary educational paradigm with the launching of Don’t Rock the Boat! Image Development workshop. This instructor-led webinar equips you with a time-tested reinvention curriculum you will receive over four compelling two-hour online sessions. Preview Don’t Rock the Boat! Image Development Workshop brochure Become the drawing power in any environment. don’t rock the Boat! is a full- day, instructor-led image development workshop pioneered by Kathryn Joy Foster for general, corporate and religious audiences. Download what you will learn. Sample Kathryn’s penmanship by browsing and buying her spiritual reinvention tools. 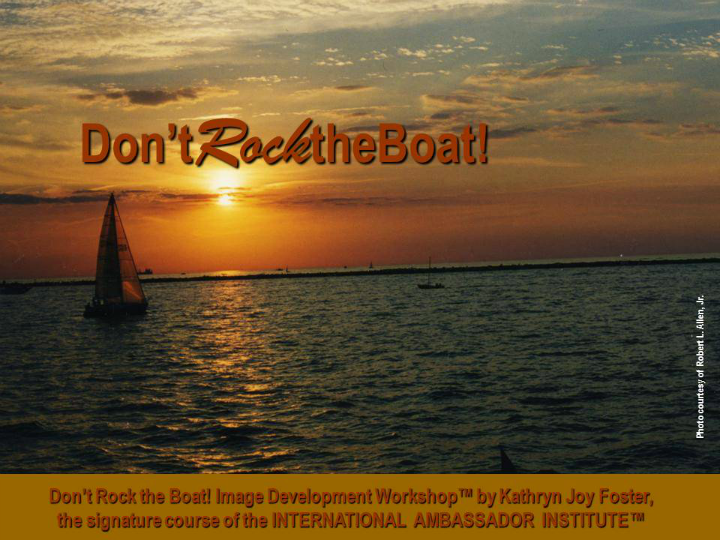 Don’t Rock the Boat is the Signature Course for the International Ambassador Institute. It is also a part of the collection under PROJECT N.O.A.H.